Design for manufacturing, or better known as DFM, is a confirmation that surrounds a product or design and its intent for being manufactured. This results in someone providing a validation or respected criticism on whether that product is ready or has the right type of design suitable for the manufacturing method that is selected. This process is typically done by someone in product development or even in some cases, done by the manufacturing company themselves. Why is DFM important to your project? The true importance of DFM is to ensure both that your product is in the best design state that it can be and that your manufacturer will have the best rate of success in producing that product. Many designers and engineers are providing a concept on a part for the first time and that concept has a very specific function to the company. This function, my not always lend itself to a seamless process into manufacturing, whatever that method may be. So, the DFM process will have someone review and inform you of any major concerns or issues that may be current on your product design. Do all companies offer DFM services? Not all companies truly offer good DFM services. 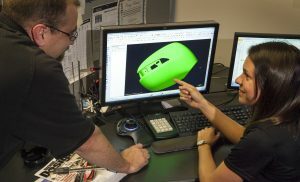 They may take a quick look at the part and make sure there are no major defects in the design that would affect manufacturing but ultimately, you want a company that can evaluate your part design, material selection for that design, and how that would correlate into a production level or prototype environment. Once you can narrow down some key portions of that design that can be altered, you are automatically increasing your chances at a more successful manufacturing experience. In most cases, you could be saving yourself lots of money in the future.